I love this rug, very good quality and very big. I have it in the space in front of the front door. The rug is true to size so make sure u measure the area u plan on putting it. Liven up your home with this rug featuring a Moroccan-inspired design that adds vibrancy to your room. 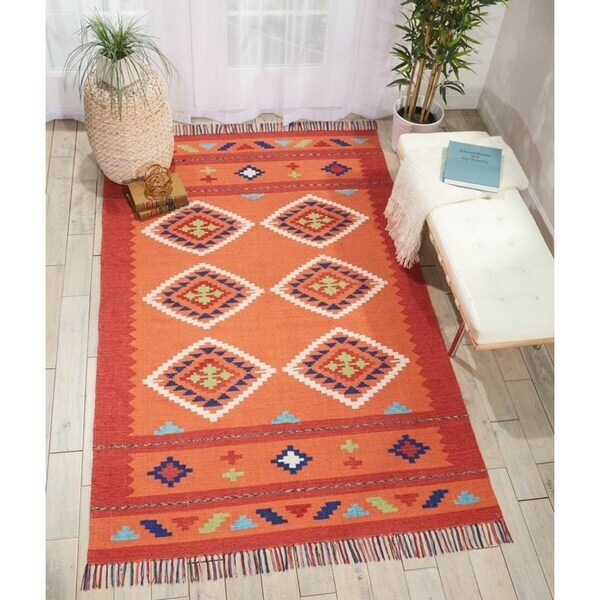 Made with soft polyester, this hand-woven kilim rug is durable to use in rooms with moderate traffic. 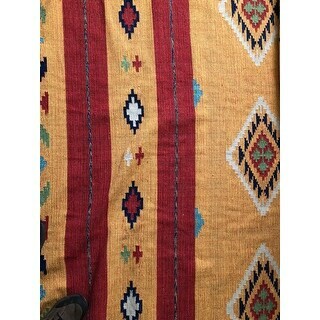 As you can see, the rug I received was not the Orange/Red Kilim rug that I ordered. It is in fact yellow/orangey red. The one star is because the rug is not the rug I ordered. The actual rug itself is nice and I can probably make it work in my living room. If not I need a new rug for my guest room and I am not putting my self through the hassle of trying to return this. I should have been suspicious when right after I hit the order button it was listed as out of stock on the website. The one star rating is for the fact that I did not receive what I ordered. As stated the rug itself is a good quality product.